Scrolling credits at the start or end of your video can be for a number of reasons. Some people might just want to pay tribute or express meaning behind their video. Others might use credits to put a thanks note to someone who have inspired them to make it. Most people use credits to name every person who appears in their video like in the end of movies as well. There can be a number of things you might want your viewers to keep in mind and scrolling credits can help you in communicating with your audience. Wondershare Filmora9 is the ultimate application for video editors. You can easily add your credits to your video in just a few clicks. There is a wide range of fonts and colors for the user to pick from. It also allows users to split and trim their videos without facing any complex methods. Wondershare Filmora9 offers you the best experience that you can expect from a good editing app. After downloading Filmora9 and click to open it. Adding opening titles or end credits to a video is usually one of the last steps in the video editing process. Before you start creating credits you'll have to arrange the video clips in a particular order, remove all parts of video clips you don't want to include in the video's final cut, perform the color correction and complete all other video and audio editing tasks. The scrolling credits are commonly added to the end of the video, although in some cases it is completely acceptable to add them at the beginning. In either case, before you add scrolling credits to your project, you should position the playhead at the exact spot on the timeline where you want the credits to be placed. Afterward, you should click on the Titles icon at the top to gain access to the software's rich collection of openers, titles or end credits presets. 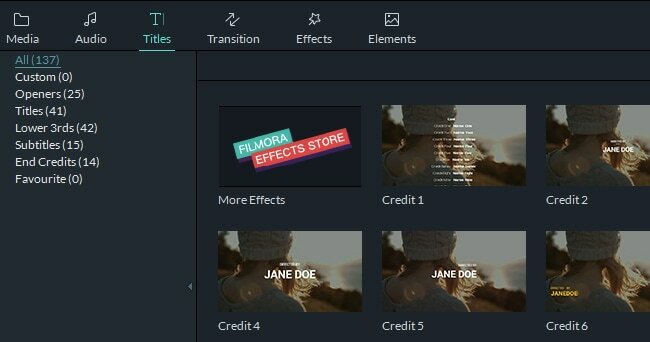 Click on the End Credits category on the left side of the screen to gain access to scrolling credits Filmora9 has to offer. Browse through the collection and double-click on a credit you like to preview it. You can right-click on the scrolling credit you'd like to add to your project and select the Apply option or you can just click on the + icon that is displayed over each credit featured in the library to add it to timeline. The software also lets you drag and drop the scrolling credits into timeline. Once you've placed it on the timeline, you can drag one of the credit's ends to change its duration. 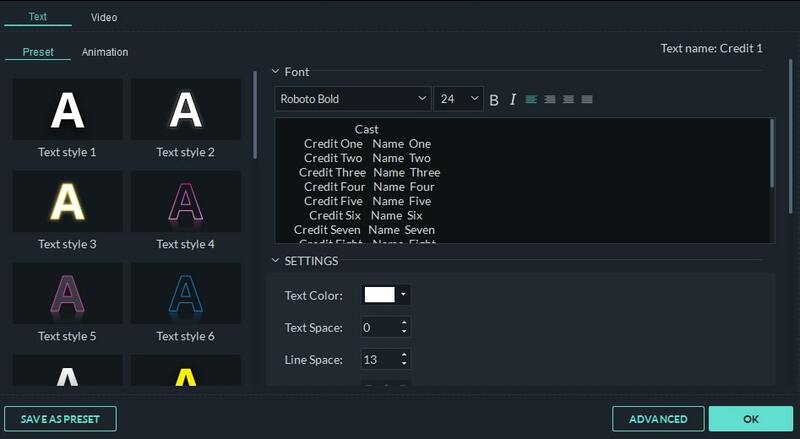 Double-click on the scrolling credit to access the software's text editor where you can insert the text and select its style or font. Furthermore, you can change the size, alignment, color or spacing of the text. Click on the Advanced button in the lower right corner of the text editor's window to gain access to more text editing tools. You can use the Fill, Border or Shadow options to improve the visual style of the text you include in the end credits. You can click on SAVE AS PRESET, so you can use the same scrolling credits again or you can just click OK to save the changes you've made to the text. 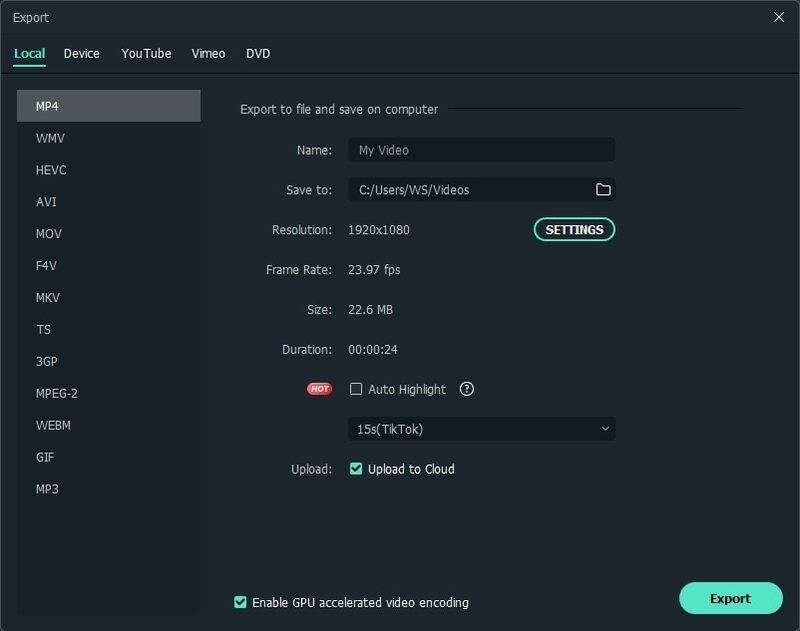 When ready you can click on the EXPORT button and choose if you want to export the video directly to YouTube and Vimeo or export it to a location on your hard drive. There are multiple effects like slow motion, tilt and many others which can be used to enhance your videos. 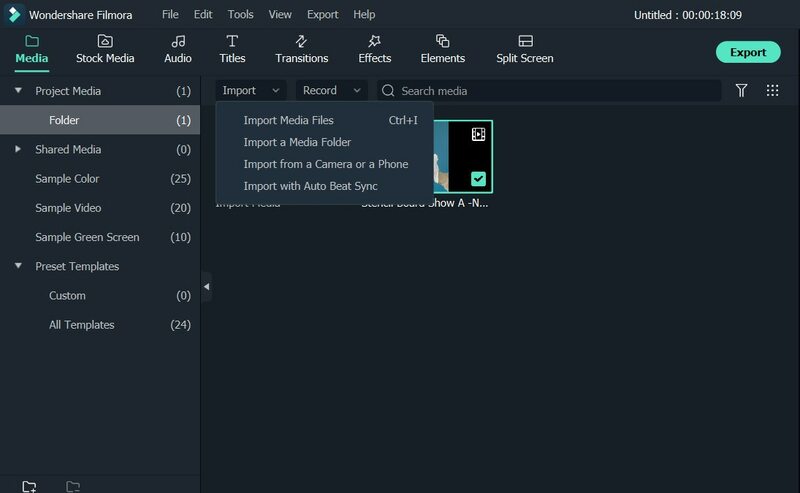 You do not have to use any other application while you are using Wondershare Filmora9 because it's an all-in-one software. You can add text to in your videos too to mention a name or other instructions too. When you are done with editing, you can easily share your video to social media website or simply save it to your PC or Mac. Nearly all modern video editing software products enable their users to create scrolling credits effortlessly. Here are a few alternatives to Filmora9 that also offer numerous ways of making scrolling credits. The software is compatible with both Windows and macOS which means that both Mac and PC users can edit their videos with it and create scrolling credits. Besides offering a decent amount of text effects, VideoPad Video Editor also offers support for a wide range of file formats and it features advanced audio editing tools. Most professional video editors agree that Adobe Premiere Pro is one of the best video editing software products ever created. Its users can create customized scrolling credits or add any other type of text effectt to their videos, but the Adobe's video editing software can be difficult to use if you have little experience with editing videos. Blockbusters such as X-men Origins: Wolverine or Burn After Reading have been edited with Final Cut Pro, which only shows that you can use this video editing software for Apple computers to create scrolling credits of the highest standard. Using Final Cut Pro to edit your videos requires advanced video editing skills, and newcomers to the world of video editing may find the abundance of features the software offers a bit overwhelming. I purchased Filmora software it is working good am very happy with this editior - but I can't slow down the credit scrolling - it is too much speed - how can I make it slow ? ?